Kamikōchi (上高地, ) is a village in central Japan, roughly between Matsumoto and Takayama, in the Japanese Alps. Kamikochi, with its mountainous scenery and large areas of undeveloped nature, is one of the most popular hiking spots in Japan. Take local train operated by Alpico Kotsu at Matsumoto Station to Shin-Shimashima Station, and change bus, which is operated by same company, to Kamikochi. 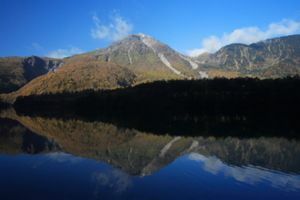 The first train departs at 04:45 and takes 25 minutes to Shin-Shimashima and 1 more hour to Kamikochi. 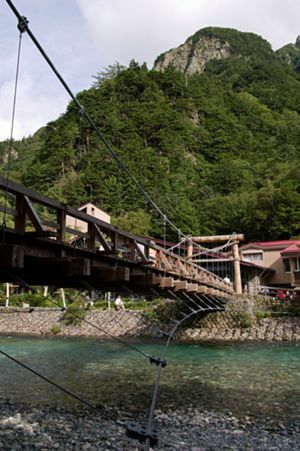 Take the bus bound for Matsumoto to Nakanoyu and change other bus to Kamikochi. Kappabashi bridge crosses river Azusa. Hike and enjoy the greenery and mountain air. Enjoy one of the most spectacular mountain views Japan has to offer. There are multiple hikes (mostly flat) available from the Tourist Centre - where the busses drop you off. You can tailor your hikes according to how much time you have to spend there. For more serious hikers, there are also many hiking routes to (and between) the mountain tops. The mountain huts do not require prior booking. Do understand that while the mountain hiking routes are beautiful, some of them are also dangerous. Research beforehand and come prepared. Along the river are several hiking lodges, most with dining rooms, and a campground renting tent sites. A more expensive option is to pre-book at one of the Ryokan and Onsen in the surrounding area. Bus connections run from the site until about 4 or 5 o'clock. Onward buses to Takayama or Matsumoto; depart 1500h in the afternoon latest. This page was last edited on 8 November 2015, at 16:26.